Temperature: 5800 K on the surface, 15,600,000 K in the core. The Sun is the center of our solar system. It is Earth’s ultimate energy source. More than 99% of the total mass of the solar system is contained in the Sun. It is made up of about 75% hydrogen and 25% helium by mass. In the Sun’s core, hydrogen is converted to helium, so these percentages change slowly over time. This conversion produces sunlight and other radiation. Although it cannot go on forever, it is estimated that the Sun will continue to shine at its present brightness for another 6 billion years. When the Sun’s hydrogen supply is burned up, it will enter a new phase of existence, during which it will burn helium. This will cause it to expand to 100 times its current size and become what is called a red giant. Once its helium supply runs out, it will collapse into a smaller object called a white dwarf. 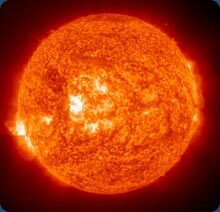 The Sun is extremely hot—in the core, it is over 18 million degrees Fahrenheit. The surface of the Sun is a bit cooler, at 10,000 degrees Fahrenheit.